Made from a natural cotton rope, these Macrame wall hangings have been weaved, woven and knotted into an intricate flag shaped pattern detailing a mix of shapes and textured delight. All the macrame hangings have been sturdily constructed and can be wall hung from the rope that is wrapped around a natural bamboo dowel. Use this decorative wall hanging to add a handmade touch to your home, office or cabin. >Cotton rope on wooden dowel. >Width of the dowel is approximately 16.0 inches. >Length of the wall hanger is approximately 23.0 inches. 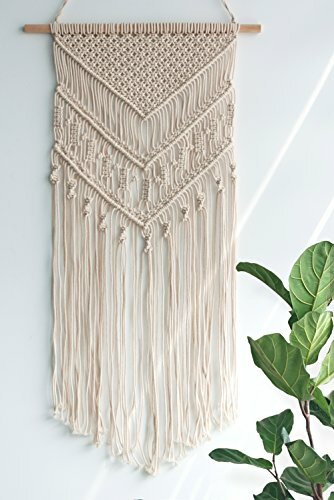 Size: Approx 14" W x 33" L (weaving design 15" L - fringe 18" L), wooden dowel 16" L.
This simple and elegant macrame hanging is perfect for adding that extra "something" to your space or event. Made with 100% cotton rope, this unique wall hanging will brighten any room. Unique design, after hours of knotting, meticulously handcrafted, using natural materials giving a minimalist feel and creating a relaxed feel in the room. Makes the perfect statement accent piece for the head of your bed, on the gallery wall or small/narrow accent walls, over a couch or by a window for a boho touch to any space. Well packed makes a perfect Eco-friendly housewarming gift for a person who enjoys bohemian art. TimeYard is a registered trademark, attention to detail is always our priority and all of our products are professional manufacturing and sole selling.